Increase your visibility on campus and support University of Miami students' career education through Sponsorship opportunities. Put your organization in the spotlight while supporting programming and new initiatives for our students! Providing financial resources allows your organization to support activities that benefit UM students. Your organization will make an impact and as a result will enjoy an increased level of visibility and branding on campus. Contact Ali Rodriguez by email or at 305-284-1819 for more information or to become a Toppel Partner or Event Sponsor today! *Note: All partnership levels are accepted on a rolling basis and include a one-year term. If you have an interest in specific career fairs, we also offer event sponsorships. Event sponsorships puts you top of mind for UM students during career-related events like industry career fairs and meet-ups. This one-time event funding also gives you the opportunity to make an impact on our students by making possible events that help them secure plans for their future. If you would like to get in front of your target market and make an impact on the students in our university community, sponsor a career event. 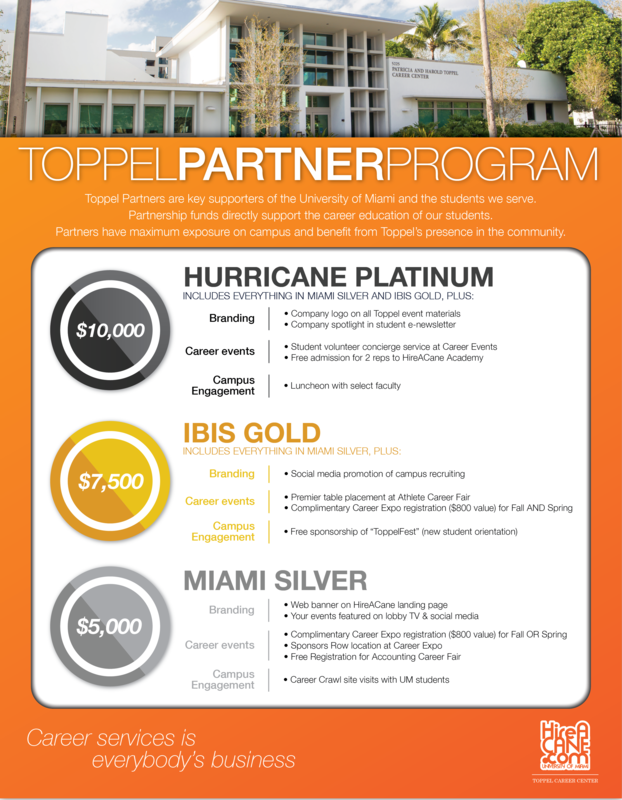 As you can see, Toppel offers multiple ways for employers to offer sponsorship via our signature Partner Program with three levels of annual giving and our Career Event Sponsorships.